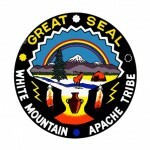 White Mountain Apache Tribe is located in the east central region of Arizona, 194 miles northeast of Phoenix. Located on the Apache, Gila and Navajo Counties, the White Mountain Apaches reside on 1.6 million acres at its ancestral homeland on the Fort Apache Indian Reservation. On November 9, 1891, by Executive Order the Fort Apache Indian Reservation was established. It is now known as the White Mountain Apache Reservation. It originally included the San Carlos Apache Reservation but was separated by an act of Congress in 1897. The White Mountain Apache are the direct descendants of the original tribes that lived in this area. The people were once nomadic, however, they now occupy permanent dwellings and depend on livestock, agriculture, tourism and various tribal enterprises for their livelihood. White Mountain Apaches hold dearly to their traditions–from their strong beliefs, the long free-handing shirt (adopted in 1870), to the Crown Dance and basketry. The Tribe has over 12,000 members located on nine major reservation communities. Whiteriver, the capital, is the largest community with over 2,500 residents. The topography ranges from 11,000 feet to 3, 000 feet at the Salt River Canyon with its Pre-Cambrian history. Major employment consists of a timber mill and re-manufacturing plant. The White Mountain Apaches own and operate one of the largest ski resorts in the Southwest, the Sunrise Ski Resort. World Class Bone and Crocker Record Elk hunts are conducted each year. Rare Apache and rainbow trout dart through hundreds of miles of fishing streams criss-crossing the reservation. A modern gambling casino at Hon Dah complements historical Fort Apache with its Cultural Museum featuring U.S. Calvary and Apache way of life presentation from Geronimo’s days. Traditional girl puberty ceremonies bind clans over the summer, starting in early May. On December 29, 1993, the Hon Dah (which means “welcome” in Apache) Casino opened for business. A 15,000 square foot facility, it offers slot machines, a poker room, and a snack bar. Whiteriver counts with a 31 room motel, a restaurant and conference room. Sunrise Park Resort, has a lodge with 96 rooms, a restaurant, bar and conference room. A lodge at Hawley Lake has 12 rooms, 49 cabins and a cafe serving breakfast and lunch. Hon Dah RV Parking has 120 sites with full amenities 66 percent are pull-through and open year-round.